Deepings Swimming Club won medals at both the British Summer Championships and the ASA National Championships. 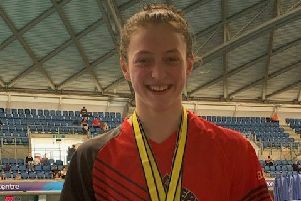 Alex Wray (17) stood out in the British Championships for swimmers ranked 1-24 in their age group at the Ponds Forge pool in Sheffield. He produced three solid performances in the heats of the 50m breaststroke, 50m freestyle and 100m freestyle where he made all three finals. He went on to show his true colours pacing all three races very well but his success came in the 50m freestyle (one of his favourite events) where he managed to secure a silver medal in 23.14, which was a new club and county record. His second best swim was in the 50m breaststroke where he touched the wall in third place to bring home a bronze in a time of 29.18 which was also another club and county record. He finished third in the heats of the 100m freestyle but despite equalling his club record it wasn’t quite good enough for a medal on this occasion as he touched in fourth place. A swim in the 50m butterfly secured him another club and county record but it wasn’t quite fast enough to make the final. Alex finished off the championships by swimming the 200m freestyle. He finished 16th in a time of 1:55.53 although not a club record but it was a new long course county record in the 18 years category. Isabel Spinley swam really well in the 200m butterfly heats (2.19.99) and went over two seconds faster in the final, just missing the bronze medal. Her efforts were rewarded with a new club and county long course record. Although she finished 13th in the 50m butterfly, she still set a new county long course record. However, Isabel saved her best event until last. She got off to a cracker of a start in 100m butterfly finishing in second place in the heats, giving her an excellent chance of a medal. In the final she powered off the blocks quite nicely just a little behind the frontrunner but she pushed the last 25m pretty hard, finishing in a time of 1:02.32, a lifetime best which was an improvement on her morning swim. Sadly she just missed the bronze medal again, but she gave it her all. Bailie Harrison (15) swam the 100m butterfly in her true gutsy style to touch the wall in a time of 1:04.48, unfortunately on this occasion it wasn’t fast enough to make the final. At the ASA National Championships for swimmers ranked 25-49 in their respective events, Harrison was again in fine form. Swimming the 50m butterfly she finished in second place in the heats. In the final Bailie’s power and speed shone through but once again she touched in second place missing the gold by just 0.3 seconds. But what Bailie didn’t know was that she had been beaten by a Canadian whose swim did not count for this competition giving Bailie the gold medal! Her time of 28.89 was not only a new county long course record but a new club record too. Isabel made another final, winning her heat in the 400m IM, just missing out on a medal touching fourth in the final. And Miki Lin-Gao also swam at the multi-disability event, taking part in the MC 50m free. Deepings’ new star Miki Lin-Gao (10) was the youngest competitor at the championships. She swam the 50m freestyle in the S8 category in a time of 45.51 seconds, her fastest so far. Lin-Gao is on the British Para Swimming Spotlight programme for future Paralympians.